Angry Koala Gear: X-Men #1 is Coming this April for Marvel NOW! X-Men #1 is Coming this April for Marvel NOW! This April, Storm, Rogue, Jubilee, Kitty Pryde, Rachel Grey, Rogue & Psylocke redefine what it means to be a Child of the Arom in X-Men #1, kicking off the all-new ongoing series by the blockbuster creative team of writer Brian Wood (Ultimate Comics X-Men) and artist Oliver Coipel (Avengers VS. X-Men)! As part ofMarvel NOW!, X-Men joins a number of titles that will take the Marvel Universe in an exciting all-new direction, as the industry’s top creators join the top Super Heroes to deliver all-new ongoing series, great for new and lapsed readers alike! "This April, double X marks the spot,"said Axel Alonso, Editor In Chief, Marvel Entertainment. 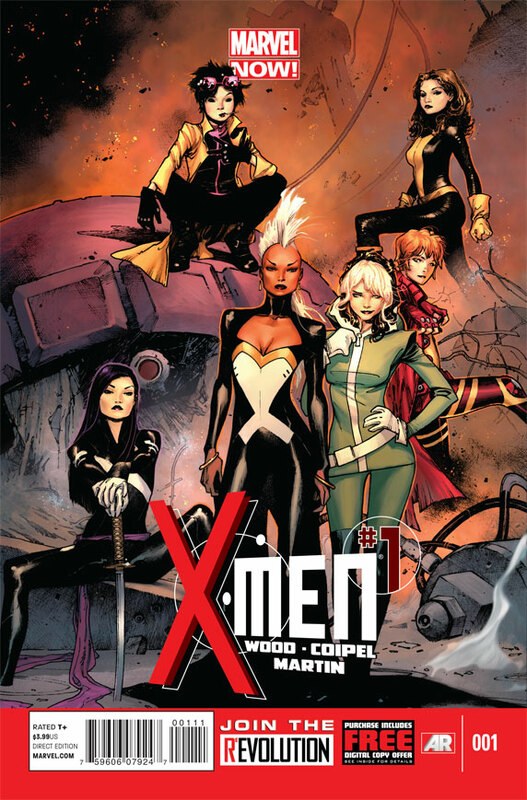 "The most popular and powerful female mutants will band together to form a team that's much more than the sum of its parts, battling for stakes that couldn't be higher. It's a mind-bending, heart-pumping, thought-provoking saga that only Brian Wood and Olivier Coipel could tell." Marvel NOW!is the culmination ofMarvel ReEvolution, the groundbreaking new initiative to evolve the comic book experience through innovation. WithX-Men, Marvel NOW! ensures fans will discover an entirely new perspective in the adventures of a brand new team. Each issue ofX-Men includes a code for a free digital copy on the Marvel Comics app (for iPhone®, iPad®, iPad Touch® & Android devices). Additionally, each issue ofX-Men features special augmented reality content available exclusive through theMarvel AR app– including cover recaps, behind the scenes features and more that add value to your reading experience at no additional cost. An all-new direction! All-new threats! All-new team! This isX-Men NOW! This April, Brian Wood and Olivier Coipel usher in a new age for Mutantkind inX-Men #1! For more onMarvel NOW!, please visit now.marvel.comand join the conversation on Twitter using #MarvelNOW.